Stroke or Brain Attack Disease is a common phenomena in today’s world. It is so common that by every few minutes there will be approximately two persons suffered a stroke in U.S. This is third leading cause of death in United States and according to statistics record, it has claimed over 130,000 lives last year alone. And from those lucky survival, many of them are left debilitated. What Cause Stroke or Brain Attack? The major cause of stroke is blood clot or break in blood vessel within the brain. This condition could be caused by variety of factors and living conditions, including, high stress level, working conditions, lack of proper sleep, alcohol or even smoking. Fast and accurate treament is therefore a crucial part in modern healing process. As indicated by many studies, if the blood clot on a stroke patient could be removed within three hours after the symptoms diagnosed, it could help to reduce risk of brain damage in a significant level. And a new device dubbed “SHELTER”, which is developed by two brothers in California, Vallabh Janardhan, a neurologist and Vikram Janardhan, an engineer as well as CEO of their Insera company, is claimed to be capable of filtering and removing blood clots and could be custom-fit for the specific length and diameter of a patient’s clot. SHELTER contains two primary components: an outer sheath for containing captured clots and an inner filament that houses a collapsible, five-millimeter-diameter, nickel-titanium mesh net that grabs and filters the clots. The inner component also contains a soft, spring-like tip and a polymer safety coating to prevent accidental puncturing of blood vessels, a risk with current clot removal devices. The SHELTER catheter would travel through the blockage to the far side of the clot where the net would be opened like an umbrella. An interventional neurologist would then carefully pull the debris into a cylindrical trap that caps the outer length of the catheter, effectively encasing the stroke at both ends. 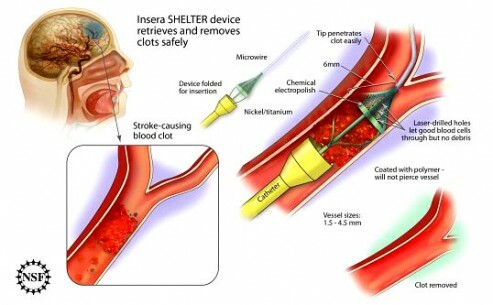 And according to info released by Gizmag, Janardhans Brothers’ SHELTER device is capable of extending the treatment window to six, eight and possibly even 12 hours after onset of stroke symptoms.Until now the developers are still hopping to run clinical trials of SHELTER in the U.S. in 2012 or 2013 and still seeking regulatory approval for the device.